OnSIP is a real-time communications solution with some impressive names in its customer rolodex including Mozilla, Tumblr, and Disqus, which lends a fair share of credibility to this brand. With one of the most extensive features listings in the industry, OnSIP caters to a wide variety of businesses, providing unparalleled service for a nominal fee. OnSIP easily integrates with some of the most widely-used CRMs and systems in the industry including Zendesk, Slack and Microsoft. Both Slack and Zendesk have their own simple integration buttons, and users have access to the developer API, so you can really customize your system to suit your needs perfectly. Additionally, OnSIP integrates with Google Analytics, an amazing feature that allows businesses to view real-time analytics with the click of a button. OnSIP has an interesting pricing structure that pretty much lets you choose the features you find most beneficial. For one thing, internal calling is free, so you only pay for external calls made and cloud phone system apps used. For another, since no contracts are required, you can change plans or opt out whenever you want without consequences. On top of the basic services such as extensions, SIP domain hosting, and developer API, clients can select from OnSIP’s menu of features to add onto their plan. Clients are charged for each feature chosen, ranging from $2-$50. So, for example, if you select on-hold music ($4.95), call recording ($4.95), and the enhanced queue and dashboard ($14.95), your plan would come to $24.85. But, as you go up in the pricing plans, there are more features included in your bundle. For example, voicemail is $2 per box, but you get 5 voicemail boxes free with your Pay as You Go plan (a $10 value). So, it’s a good idea to add up the cost of the features you're interested in before choosing the right plan for you. Phone numbers are also $2 per month ($7 setup fee), and bulk bundle minutes are available at a discount of 5% off for 300,000 minutes/month or 10% off for 500,000 minutes/month. OnSIP also offers a 30-day all apps free trial, which allows you to test out all of the features available within the system completely free of charge. This is a generous offer by any means, and it’s a fantastic way to get to know the system before investing in the service. There’s a lot of wiggle room with OnSIP’s pricing scheme, and the ala carte system makes professional calling plans more affordable for businesses with a limited budget. OnSIP offers a fabulous laptop app that lets you take business on the go without compromising quality. From Windows to Mac devices, the app provides crisp voice and video calling functionality both within your network and for outbound calls. 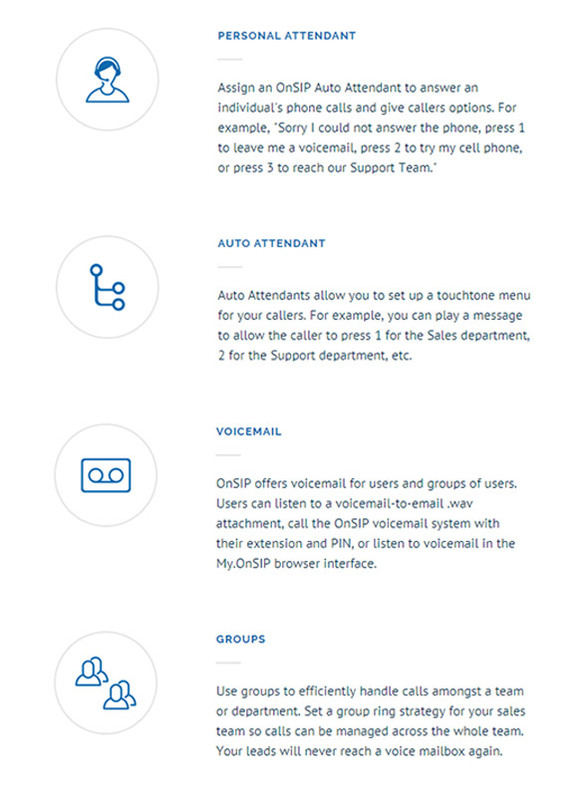 Whether you want to use the system for team collaboration while some staff members are away from their desk, to join several teams together in various locations, or to contact clients when employees are out of office, the OnSIP app is available for high-definition (HD) calling capabilities. Aside from the quality and ease of use, we really liked that the OnSIP app was free and available to any clients regardless of the plan they chose. The app runs on Opera, Chrome, and Firefox, and OnSIP provides detailed setup guides for each OS. Users will have access to all of their contact information, set presence indicators, and answer inbound calls. Additionally, users can set call preferences such as call transfer, hold, mute, and even video pausing from within the app. It’s a well-designed application that makes working from home, while traveling, or even from a remote location much more manageable and pleasant for both clients and users. OnSIP is incredibly scalable. Since plans are ala carte, you can decide exactly how much of each service or feature you want to pay for or need to utilize at any given time. If your company starts to grow, simply opt into more features, users, lines, or minutes to take advantage of cheaper bulk bundles and to make your company communications solutions more efficient to accommodate the sudden growth. Alternatively, if you have slower periods planned into your fiscal year, then you can already plan these downtimes into your OnSIP scheme, cutting back on less important services or minimizing the number of users you pay for during that slow season to better jive with your downtime budget. In short, OnSIP is extremely scalable, and it’s one of the strongest features that businesses love. OnSIP setup takes all of a few minutes, but if you have no idea about any of the more technical aspects of communications, it might help to hire an outside party to handle this part of the job. Of course, OnSIP has a great help center that has a wide database of articles guaranteed to guide you through setup and management with ease. The help center is divided into relevant sections so you can quickly find the area you’re looking for, and you can zip through everything via the search function at the bottom of the page, as well. So, if you’re up for a little trial and error, you really don't even have to outsource the job. You can also contact customer service, and have them walk you through the process for smooth integration. Once set up, call and preference management is a breeze thanks to OnSIP’s handy online dashboard. All your settings options are clearly displayed in a nice UI. Once again, helpful video tutorials provide you with all the instruction you need to set up your account just the way you like it. OnSIP also works with softphones if you prefer skipping the whole installation and configuration step of the process, or if you like to work on the go. All OnSIP equipment and softphone setup is easy to maneuver whether you are working with a Windows or Mac desktop. Customers rave about OnSIP’s customer care. The representatives are professional and highly trained so they have a lot of the information you need already on hand when you call. If they don’t, though, reps are punctilious about finding answers to your questions, and even follow up in order to make sure your issue has been fully resolved. Customer support can also recognize when you are trying to configure a setting that won’t be beneficial to your business plan. OnSIP customer service can be reached via several toll-free numbers, or you can submit a question via the online form. Additionally, OnSIP has one of the most comprehensive help sections we’ve ever seen. It’s neatly organized into helpful sections, so you can find what you’re looking for at a glance. Finally, there is also a blog where you can learn useful information about the services and business practices in general. OnSIP offers international dialing directly within its service plans via the convenience and advanced technology of VoIP phone systems. Members can utilize their plans to make international VoIP calls by submitting a simple extended dialing form to the OnSIP. This is found under the Support tab via the Admin portal of their account. Rates vary but average about $0.50/minute, a competitive rate for international calling. Additionally, anyone within your SIP network can be called for free over the VoIP service, so you can easily collaborate with other teams and even customers within your network for less than you would normally pay for international calling. This is not the most competitively priced option on the market, though. OnSIP’s unified communications solution is fantastic. It offers a tremendous variety of tools that let you easily communicate and collaborate with team members including voice, video, and chat functionality across your network. The Slack integration makes these kinds of communications a breeze, as well. The beauty of using these slash-linked commands is that users get high-definition and completely secure video and calling features to anyone within your OnSIP network. You can create conference meetings, make announcements across the office, or coordinate a call queue with ease using OnSIP’s unified communications channel. The worst thing we could say about OnSIP is that it has too many choices. The feature-rich services are exhaustive, options abound, and you can really find anything you could possibly hope to from a telecommunications service within the gamut of their offerings. In short, OnSIP is a one-stop-shop that provides businesses of every size with exactly what they need to communicate both externally and internally with ease. Scalable, mobile, and customer-friendly, OnSIP is a highly recommended service with good pricing tiers to accommodate any budget, and a professional, reliable service to boot. Whether you are a small home office gig or a major corporation, OnSIP is an excellent choice. Founded in 2004, OnSIP has remained a small but strong entity in the internet communications industry. Servicing more than 45,000+ businesses, its goal is to help businesses everywhere create a smoother, faster, easier, and more professional communications network. 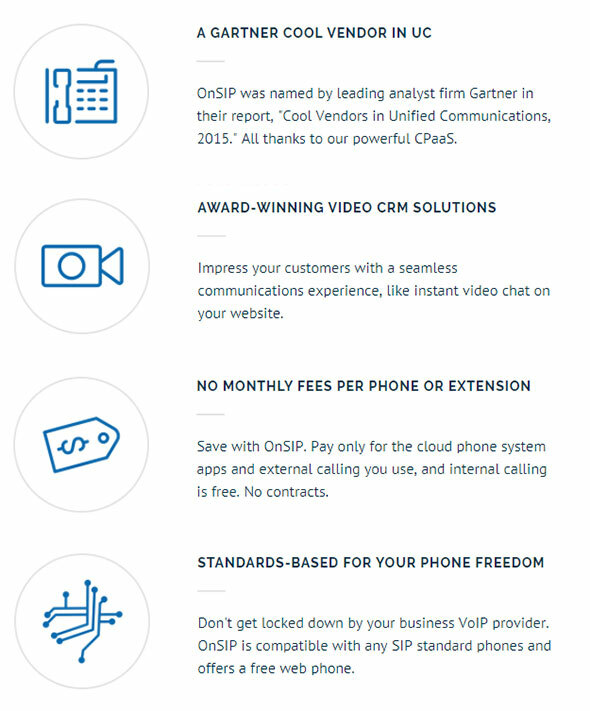 Recently included in Gartner’s Cool Vendors in Unified Communications, OnSIP has proven its reliability, strength, and innovation time and time again, delivering the kind of quality service customers can depend on and a features suite to please even the pickiest users. Currently, OnSIP offers cloud-based, VoIP, SIP, and other phone and communication systems for businesses.